A demerit point suspension cannot be appealed. However, you may appeal through the courts the individual conviction that resulted in the suspension. Please refer to the instructions on the back of the ticket and be sure to take action in the required time frame. Once demerit points are assigned, you cannot have these demerit points removed (although you can earn Merit Points, please see below). If you have a Class 5 GDL License, you can accumulate up to 7 points and keep your license. Once you reach 8 or more demerit points, your license will be immediately suspended for 30 days. If you have a Class 5 (Non-GDL) license, your licence will be suspended for 30 days once you exceed 14 points. This is why we encourage Alberta drivers who are eligible to go for the Class 5 Advanced Road Test and upgrade to a Class 5 Non-GDL License. Note that once a suspension occurs, you will not be eligible to go for the Advanced Road Test for one year. The length of the suspension depends upon how many suspensions you have had. Please note that at any time you can be required to appear before the Alberta Transportation Safety Board (ATSB). First suspension: your license will be suspended for one month. Second suspension within one year: your license will be suspended for three months. Third suspension within two years: your license will be suspended for six months. 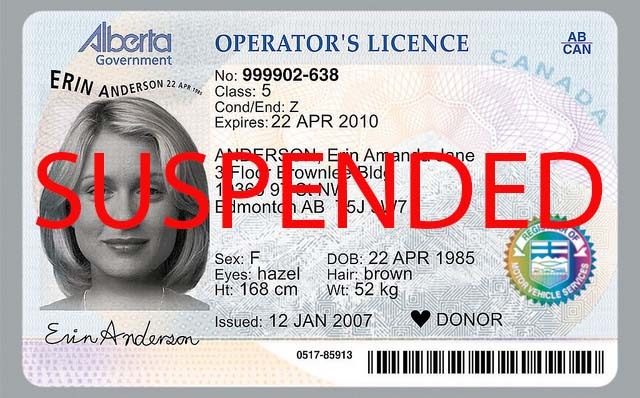 Once you receive notification by mail from Service Alberta about your DL suspension, you will need to visit Registries Plus to surrender your Driver’s Licence card. Wait one month (or longer if this is a subsequent suspension). Visit Registries Plus to pay the reinstatement fee of $59.45 plus the $22.45 new card fee. Please note that if you have any overdue fines, you will need to take care of these before the system will allow us to reinstate your license. Your Class 5 GDL License will be reinstated with 3 points. If you have a Class 5 non-GDL License, you will be reinstated with 7 points. These points will remain on the license for 2 years. We offer an Alberta Transportation approved Defensive Driving course which can effectively reduce your demerits by 3 points. You will need to purchase the course, complete the 6.5 hour online course (you can stop and start the course in your own time), successfully pass an online test with 60 questions and then request a completion certificate to be mailed to you. When you complete the course, the Driving School will issue you with a certificate of completion. Bring the certificate to us and we will enter the credit for 3 demerit points (there is a $9.45 service fee). Please note that the system cannot issue credit for demerits you don’t have. For example, if you have two demerit points and you provide a Defensive Driving Course certificate, your balance will go down to zero demerit points (not -1). The certificate is valid for two years from the date of issue. You can complete the Defensive Driving Course and earn merit points once every two years. Note: the demerit points are assigned to your motor vehicle file after the conviction date, not on the date you are pulled over. 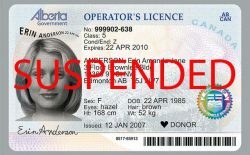 For example, if you are pulled over on March 1st and the court date on the ticket says May 10th, you have from March 1 until May 9th to take action to increase the number of allowable demerits by either taking a demerit reduction course or by upgrading to a full GDL licence, assuming you are eligible. Once the conviction date comes (i.e. you don’t got to court or you go to court and the charge is not dropped or reduced), the demerits will be added to your file and cannot be appealed. Furthermore, if this results in your GDL licence being suspended (i.e. you get 8 demerits), you won’t be eligible to go for the Advanced Road Test for one year. This is why we encourage people to go for the Advanced Road Test as soon as they are eligible or at least immediately after being pulled over, ahead of the conviction date.